I added a memory lookup as well using mem:read_u8() and noticed that it doesn't account for which hi-res page is displayed, so let's look that up in an item called ":a2video/0/m_page2". and if I do a search with "find 0,c000,7c,44,44,7c,46,46,46" it tells that it's found at 7A08, and further study finds the text font starting at 0x7900. Last edited by Golden Child; 01/31/19 09:28 AM. Ok, more silly fun. The hits keep coming! I've added cross hairs that will show the byte boundaries and the line boundaries, and if you press the 1 or 2 keys you can switch hi-res pages. R.Belmont, thanks for explaining, makes sense now why it wasn't working the way I expected. I did convert my sysutils1.3 dsk to po, and it also did not work, so had me confused a bit. That disk image that did not work was just my attempt at putting atomic-defense back together from my disassembled source. The boot sector for it uses the block io inbuilt into the apple3 firmware, so it was easier to just use a prodos ordered disk to just add the code parts together to make an image. I don't think there is much point adding this one in at the moment, i'll just convert to dsk and work with that for now. And still on Atomic-defense, I worked out why the text screen disappears during the game play on some machines. The Alpha Lock key is checked by the code! If the key is down, then the text displaying the score is kept at the top. If the key is released, then the code times 240 VBL periods (4 seconds) and then removes the text from the top. It Mame it works ok once you toggle it in the game, although Mame does not seem to carry in the current state of the capslock key into the emulator on startup. 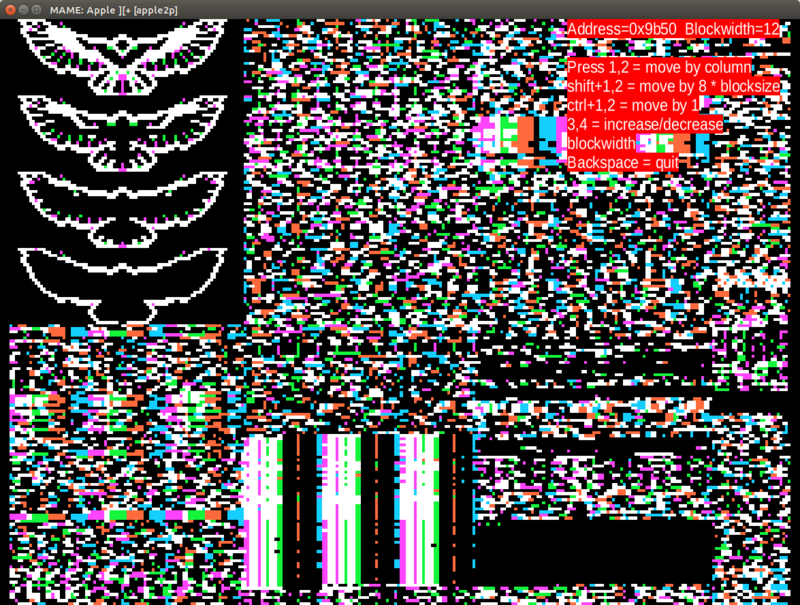 I thought I'd try and see if I could create a memory viewer that writes into the hi-res graphics page #1. It's kind of cool, you can see that Stellar 7's menus will "fight" over drawing into the hi-res page. There's also a really neat effect where if you scroll into hi-res page #1 memory range that the bytes will shimmer and disappear. 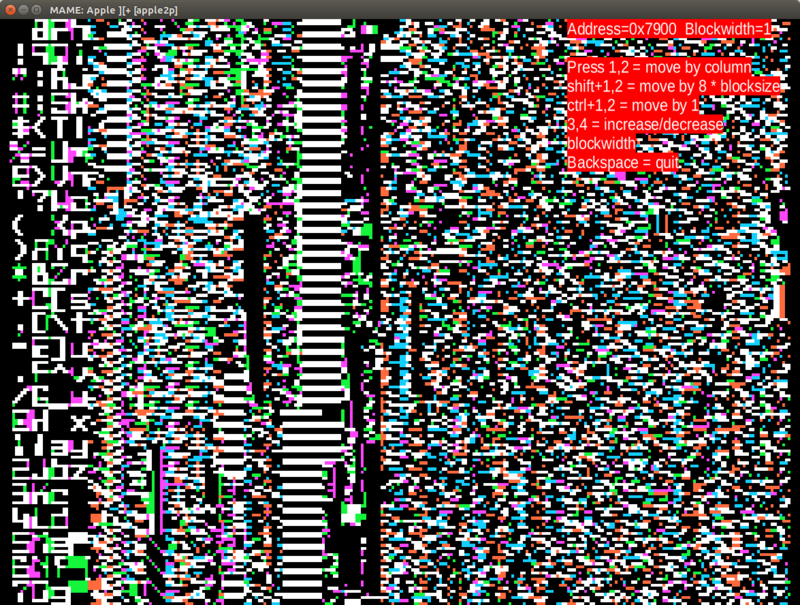 I was trying to set the monitor type "on the fly" in the apple2p driver from lua, and was having problems. There's an ioport named ":a2_config" that controls the configuration of the "Composite monitor type" from 0=Color, 1=B+W, 2=Green, 3=Amber. but for some reason, when I read it, it doesn't seem to change it right away. and what's weird is that it the port's read() value seems to lag where it changes to a value that I've set awhile back. I can see the monitor type change at different points but it seems very disconnected from what I'm trying to write to the port. It seems to be sensitive to actually sending a different number to set_value. Edit: I wrote a little function that will call setvalue(0) and setvalue(1) and have an emu:wait() in between. What's strange is that it seems to cycle the values for the monitor type 0,1,2,3 and you can see the monitor type change, cycling through (color,b&w,green,amber) in the apple2 display which doesn't make sense to me. I think that the ioport values update every frame so if I wait a little bit, and set_value again, I could get it to cycle on purpose. Last edited by Golden Child; 02/02/19 06:04 PM. Right, I/O ports update at VBL time, so once a frame. 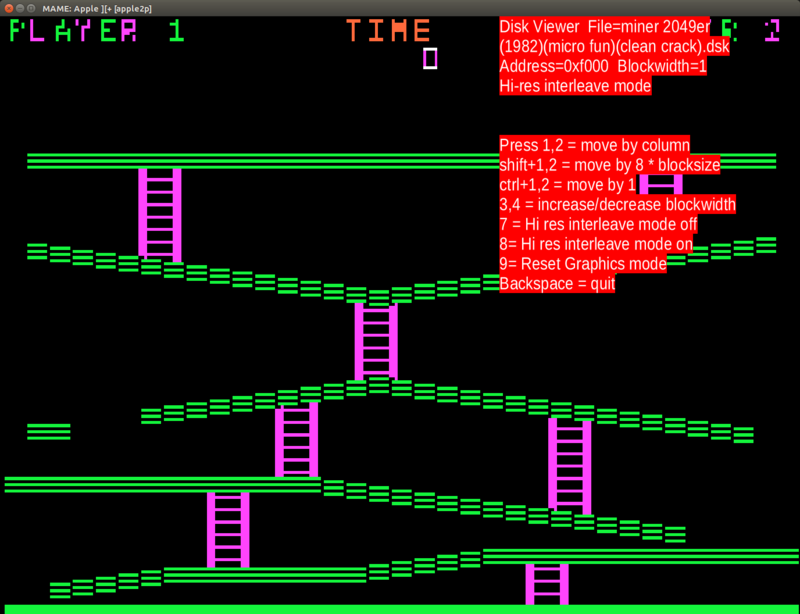 I thought I'd try the memviewer thing on Miner 2049er to see what's in memory. 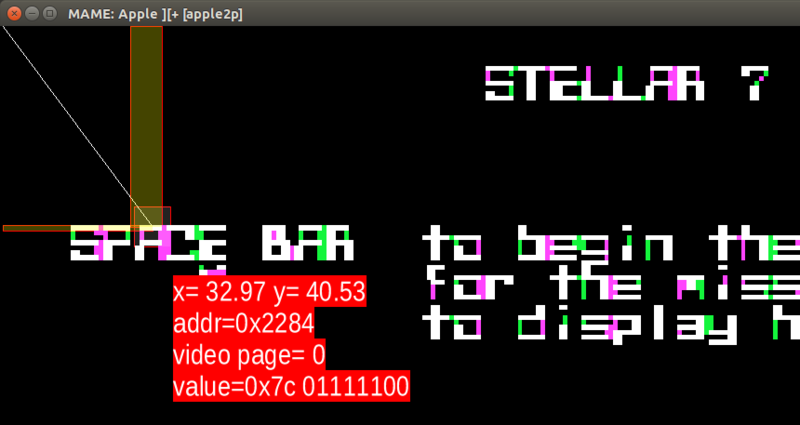 I had to pause the game, and then b!c054=1 in the debugger. It's kind of cool to see how all the graphics were laid out in memory, with 7 copies of each graphic shifted by 1 pixel. So I was perusing miner 2049er main memory looking for where it draws the words PLAYER 1 and PLAYER2 but I couldn't find it. I finally figured out it was loading the screens from disk. How to view them? Why just rewrite my memory viewer to load the data from a .dsk file instead. Just read a .dsk file into a lua string and use that as the data source. I just let the miner 2049er program crash, since it loads some of its code into the first hi-res page and then it won't be competing for the hi-res page 0. I set up the "9" key to re initialize graphics mode. 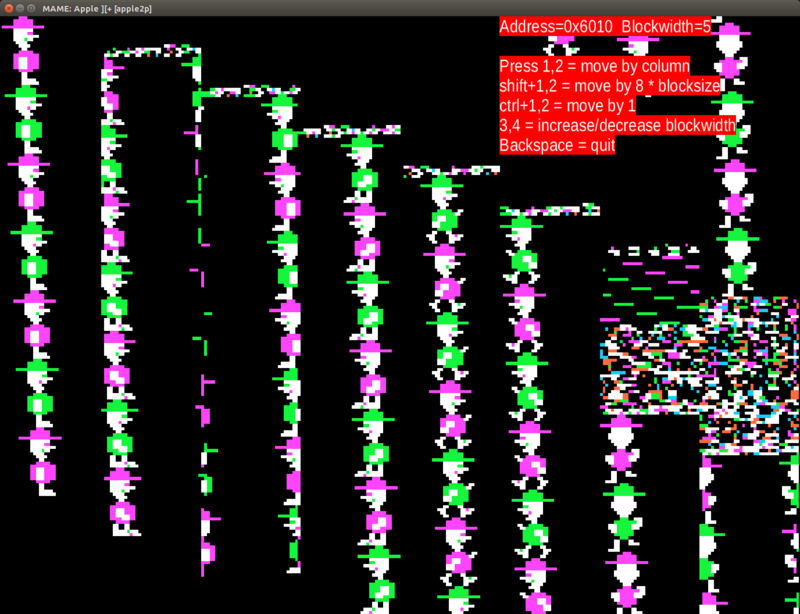 It's neat to scroll through the disk stepping by blocks of 256 bytes, when it comes across a hi-res screen it's like it's "tuning" into view like a television. Last edited by Golden Child; 02/03/19 10:40 AM.